Recently, the Sanya government announced that the 9th Dragon-Head-Raising Festival (Long Tai Tou Festival) will take place at Sanya Nanshan Dongtian Park on March 13th. According to folk legend, the 2nd day of the second lunar month is the very day that the dragon king who is in charge of the clouds and rain will raise his head. After that day, there will be more and more spring rain to nourish the crops, so it’s referred to as Dragon-Head-Raising Festival. 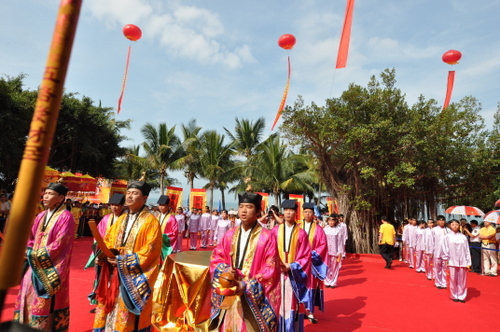 Every year when this day comes, a series of Hainan folk cultural activities will be held in Sanya, such as Li & Miao’s traditional singing and dancing shows, a Dongtian Temple Fair and a Lingao puppet show. This year the event will have 5 main themed activities, namely: the South China Sea Blessing Ceremony, the Dongtian lecture, Eryue’er Hainan Temple Fair, Dongtian calligraphy and painting competition, the climbing mountain competition. 1. The South China Sea Blessing Ceremony The event will be held from 9：00 am to 10：30 am at Dongtian Park on March 13, and more than 300 fishing boats will attend. The event will run from March 8 to 13, 2013 at Dongtian Park, and many shows will be held including a Li & Miao traditional song and dance show, Lingao puppet show and Hainan specialties show. The lecture will be held in March 11, 2013 at Dongtian Park. Well-known figures will be invited to share their regimen methods based on traditional Taoist healthcare theories and Hainan regional features with the public. 4. The climbing competition to Aoshan Mountain The event is to be held in March 13, Dongtian Park will offer the winners exquisite gifts. The event, which will run from March 1 to 31, 2013 at Dongtian Park, aims to show the beautiful ecological environment and economic prosperity of Hainan as an international tourism island.